Want to step into an exciting new season of pioneering, adventure and challenge in discipling the nations for Jesus? Lighthouse to the Nations Church will host a two day information, training and planning time for South America. Tuesday evening we will braai together at Bruce McAlpine’s home. The NCMI Team recently received a strong prophetic word from Gill Patterson that South America is on God’s radar for our future. And it is happening! Right now we are working into Venezuela, Colombia and Brazil. Pioneer trips are planned for Argentina and doors are open in Chile and other nations too. 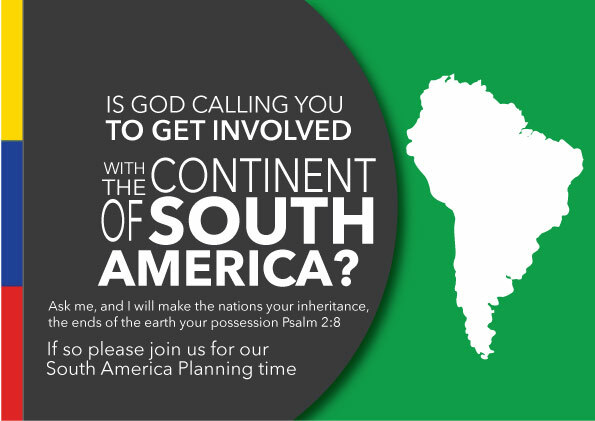 In May we have a four nations trip planned and will be hosting a team from South America for the World Equip. Doors are opening faster than we can keep up with. What we need is a BIGGER TEAM! If you feel God has stirred your heart and want to be part of what we are involved in or want to find out more, please RSVP to Bruce (bruce@thelighthouse.org.za) or Brent (brent.brading@gmail.com). May the Lord grip your heart!